Meet a few minutes early at Silver Lake Bicycle Centre for a 10am start. Steady pace 12-14 mph, 20+ miles, A/B terrain. Loop ride routes vary. Mid-ride break with optional lunch and/or coffee after the ride. Ice, snow, or steady rain cancels. Check the Rides Updates page or call. 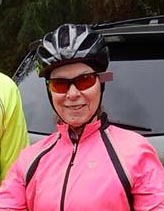 Ride leader Cheryl Funkhouse 253-732-9308 or other competent BIKES ride leader.